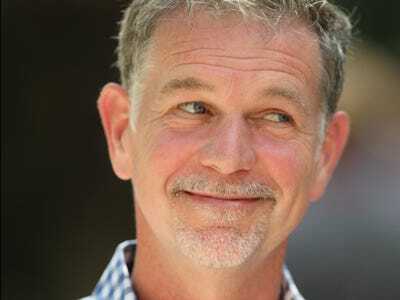 Getty/Scott OlsonNetflix CEO Reed Hastings. Netflix has a love-hate relationship with traditional TV networks, who they both licence shows from and compete with. They are “frenemies,” as Netflix’s head of content Ted Sarandos puts it (he tells Fortune that CBS CEO Les Moonves taught him the word). And one of the major points of contention between Netflix and networks is the fact that Netflix doesn’t divulge ratings. Not even its stars, like Tina Fey, know how many people are watching their Netflix shows. FX CEO John Landgraf and others have railed against the practice as unfair. But don’t expect Netflix to change any time soon. Why is Netflix so secretive about data? Netflix is trying to shake up the traditional television landscape without having the entire industry turn on it. And Hastings’ comments suggest that part of the strategy is to keep Netflix’s success in hitmaking, or lack thereof, murky — at least for now. Correction: Fortune’s original article erroneously attributed the final quote to Netflix CEO Reed Hastings. It was, in fact, from Ted Sarandos.